Bloodborne has thrown some nasty stuff at you so far but this: this takes the cake. The problem is that once you start wailing on Rom a whole bunch of gross spiders will spawn in and start smacking you up; killing them all takes ages, due to the number, and exposes you to risk. What a nightmare, amirite? Except if you are comfortable fighting without lock-on this can be pretty easy. 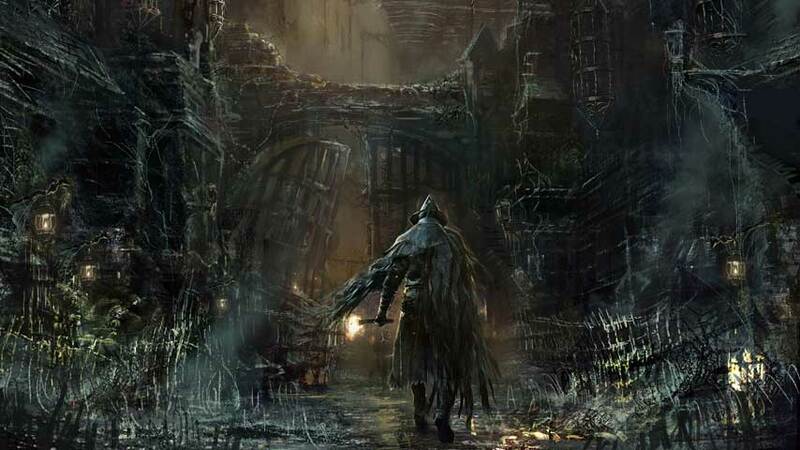 This is another of those points where Bloodborne is gating itself by insisting you learn a new skill – if you can master it, it’s one of the more valuable skills for advanced play, and is a much more sane strategy than grinding to over-level to manage this one battle. So, here’s your approach: you’re going to sprint right past the spiders (hold down Circle) and make your way to Rom’s side. It has no armour here, and you can get a lot more damage done than hitting it head-on. The spiders will mob you, but you, not being locked on, can keep an eye on them with the free camera. You might only have time for a couple of hits before you have to roll away, but trust me: this will get you there. Drag the spiders as far away as you can, then sprint back over and have another go at Rom. Rinse, repeat, profit. Eventually Rom will stir to action, slowly disappearing into a white light. This blast isn’t dangerous at all, so get in close and wail away; you get a great opportunity for more damage than usual. Once Rom has totally vanished, run away from the pack of spiders and look for their master. Every time Rom disappears a new pack of spiders will appear, so remember that if your plan is to keep taking them down. If Rom rolls onto its back, move far away to avoid the boulders that fly up from the ground in the area surrounding him. If Rom lifts its head, the boulders are about to target you; dodge repeatedly in one direction, away from Rom. This may repeat several times, so try to get back close to Rom between bombardments or you’ll end up miles away with no time to attack. If Rom glows with blue light, immediately move a small distance away to avoid an AoE attack. Additionally, every time you approach Rom now he’ll go nuts, and he can damage you in his wild flailing. Tease him into this by feinting for his side, then back away. For the next few seconds he won’t frenzy again, so this is your opportunity to get a smacking in. Look, I know this is frustrating and boring – sometimes you only get one hit in and then you have to dodge for ages. But Rom can’t heal, and as soon as he’s dead all his mates bugger off, without you ever having to touch one. Just stay alive, fight a war of attrition, and this is genuinely easy. Oh alright, if you really must kill off all the spiders: they have a combo, a jumping attack and a very nasty dive bomb. Only worry about the dive bomb; the other attacks are easy to weather and Regain through. You may need to lead the pack to draw it out, so that you aren’t taking on every single one at once. However you take him down, Rom’s death rewards you with a Kin Coldblood. Here’s a great video from doritokllr showing how to take Rom down using the Flamesprayer, which you can obtain from Gilbert in Central Yharnam. We’re not quite done yet: notice there’s no lantern here. You’re about to be transported to Yahar’gul, Unseen Village. It’s okay! You’re supposed to be here this time. Approach the NPC and you’ll see a cutscene. As soon as you have control again, run away from the stairs and through the doorway, avoiding a portal. Go down the stairs ahead of you. Kill the two Henchmen, go down the stairs, and look behind you to grab a Frenzied Coldblood. Go further downstairs and you’ll get to the main Yahar’gul, Unseen Village lantern. This seems a good point to break. Next we’re off to explore Yahar’gul, Unseen Village.